"How are you so old?" 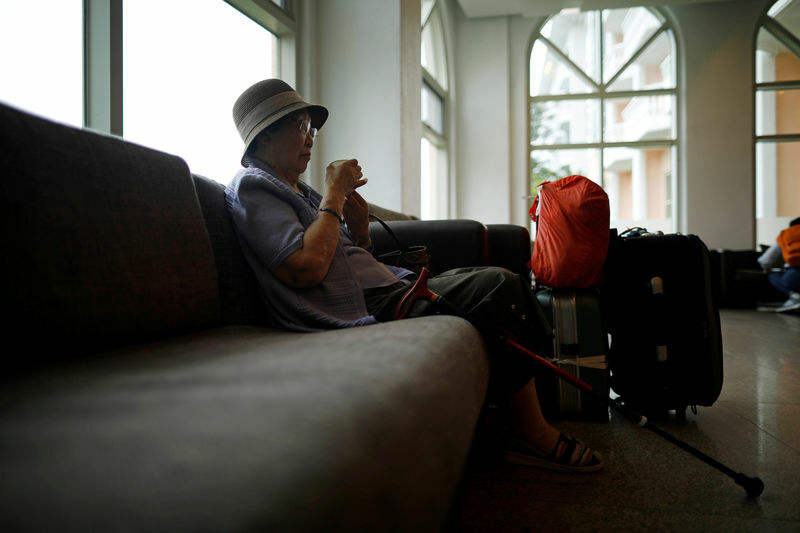 Kim Dal-in, 92, asked his sister, Yu Dok, after gazing at her briefly in silence. "I've lived this long to meet you," replied the 85-year-old, wiping away tears as she clasped a photograph of her brother in his youth. "When I fled home in the war...," Han said, faltering as she choked with emotion and left her sentence incomplete. "It is a shame for both governments that many of the families have passed away without knowing whether their lost relatives were alive," he told presidential secretaries at a meeting. "Expanding and accelerating family reunions is a top priority." For Lee Jong-shik, 81, Monday's reunion was a hard-won second chance to track down his younger brother, Ri Chong Song, after the failure of a 2009 effort when a different individual showed up, to the dismay of the family from the South. "I tried so hard, too, searching for you for seven years," Ri told his brother. "Most participants are elderly and many suffer from hypertension, diabetes and have underlying medical conditions," said physician Han Sang-jo. "Ahead of the reunions, we are thoroughly checking their health." "Whenever I saw pretty clothes, I always thought how cute they would look in them," she said. History In Singapore--Made Or Remade?